October 4th is National Taco Day which coincides with the opening day of lobster season, which October 1st. John and the guys will be lobstering this weekend near Catalina - a perfect time to prepare “Julia’s Tacos,” one of everyone’s favorite dinners aboard. If you’ve read Salad Joy, you know that I’m all about the Do-Ahead. For all-guy lobster trips, dinner absolutely must be a do-ahead, so all they have to do is assemble. Skirt steak is the star of this meal. Start with the best from Gelson's. The day before they leave I season two to three pounds of skirt steak with salt, pepper and garlic powder and grill it medium rare. Grill on high heat to get a good char. Let it rest before cubing to lock in the juices and flavor. Grill on high heat to get a good char on the meat. 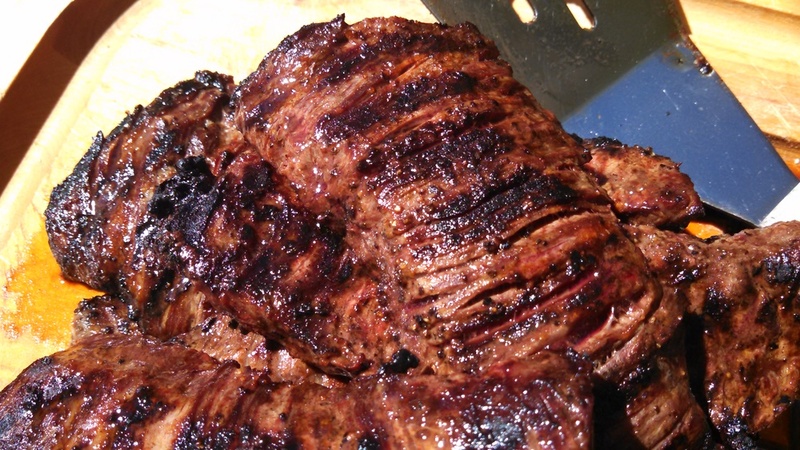 Cut the grilled skirt steak into small cubes and double bag it in re-sealable plastic bags for an easy Do-Ahead. I also finely chop up a couple of onions and put them in re-sealable plastic bags. I like using the soft corn tortillas instead of the pre-made shells. The rest of the fixins are easy to pack up for the boat. These simple ingredients are easy to assemble for a delicious Do-Ahead dinner. When it’s time for dinner between pulling pots, John will microwave the tortillas wrapped in damp paper towels, re-heat the skirt steak and serve with the chopped onions, grated cheddar, salsa and some cilantro. Everyone makes their own tacos. As there is usually left over steak and tortillas, they scramble the steak in with their eggs for killer breakfast burritos. When they return, I hope I will have a reason to create a recipe for lobster tacos!